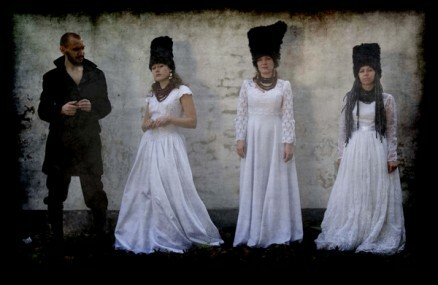 The theatrical cult phenomenon DakhaBrakha is a quartet of multi-instrumental singers from Kiev who draw on Ukrainian folk melodies and rhythms to create wild music that is simultaneously cutting-edge and deeply imbued with tradition. Three young women dramatically clad in wedding dresses and tall Cossack-style hats sing in soaring ‘white-voice’ (open throat or no vibrato), while thundering drums are interwoven with a folk-pattern-painted cello. The male singer/instrumentalist of the group generates a tense rhythmic chug on accordions and other instruments or occasionally a surprising high vocal lead. Visually striking and outrageously mesmerizing in sound.